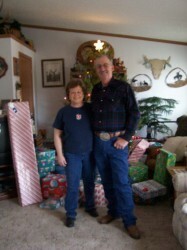 John and Jeanie Wilkinson have been guiding and outfitting hunters for over 40 years. 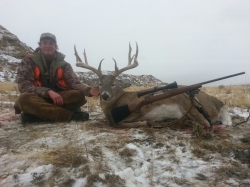 They have built Cottonwood Outfitters as one of the premier and most respected outfitter companies in Montana. Hard work, lots of sweat and perseverance is what you will notice Cottonwood Outfitters is all about when you show up to hunting camp thanks to John and Jeanie. John is an older fella, in fact none of us are too sure how old. We heard rumor he helped build the first railroad if that gives you an idea though. John was the President of Montana Guides and Outfitters in 2006 and 2007 and is a past 2 year term member of the Private Lands/Public Wildlife Council. 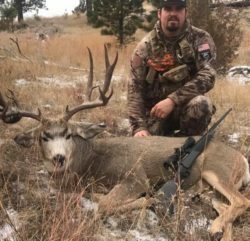 He is also a present member of the Montana Board of Outfitters which is a 5 person board appointed by the governor of Montana. Although he may be a bit weathered, it does not show for he can still hike the hills, cape a deer in 24.7 seconds (give or take a second or two), and spot a great trophy anywhere in the landscape. Just be sure he changes is glasses towards low light. He has been known to head for camp during primetime hunting because he was wearing his sunglasses, turns out it makes it look a lot darker than it truly is. His personality, knowledge and experience for hunting is something a younger guide or outfitter could only hope to have in their future. Jeanie cooks, cleans, books hunters, helps organize and sends hunting applications. She also checks to make sure they are correctly completed and sent to the state of Montana (and somehow finds time to keep John in line). Her cooking is really something else. We can assure you that if you do not gain weight during your hunt, it’s your fault for not eating enough do to the fact that there are always mass amounts provided. Her hardy meals with always a wonderful desert are sure to put a hunter to rest earlier than they had intended. John and the guides particularly enjoy her flat cake. You ask what flat cake is? And all we can say is you will just have to come to camp and try it while hearing the story behind the extravagant creation. She is one of the nicest and warm hearted persons you could ever meet. Just be sure to stay out of her kitchen when she is preparing a meal, you would not believe how much a spatula can hurt even when you’re a grown adult. Pictured here is Roger Bryant, a 38 year old Virgo who has been hunting himself for 26 years and with Cottonwood Outfitters for 10. If you are entertained by “stories” and want to hear lots of them, Roger is a good match. Roger is a busy man with a family and a full time job on a ranch/farm, but finds time to primarily guide for rifle deer with Cottonwood. Roger is a great time for any of our hunters and works hard to be sure their hunting experience with Cottonwood Outfitters is exactly what they expected. His years of hunting himself and guiding have given him great knowledge towards big game behavior, a must to an enjoyable and successful hunt. If he whips out a little book while you are on your hunt don’t worry, nothing is horribly wrong, he is just reminding himself the difference between a deer, antelope and big foot. Pictured here is Shawn Swenson, a 25 year old Zodiac who has been hunting himself for 13 years. He has guided with Cottonwood for 5 years now. Shawn still has some things to find out about guiding. He learned the hard way what happens when your hunters tag out the first day of the hunt, Jeanie takes full advantage of extra help and utilized his cleaning abilities on the toilets; ha oh young pups! He grew up in Miles City and works on his uncles ranch the rest of the year. Sean’s eye sight is quite impressive and he has a great sense of humor. He will be sure you do not have a dull moment on your hunt. Paul Pauley, an individual of care, cuddliness, goatee and LEGS! You will find yourself running to keep up with him while he leisurely walks along. 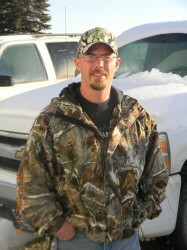 Paul has guided with Cottonwood since he was a wee lad, approximately 20 years. He does not guide full time. He works for the BLM office in Miles City so takes enough days off to guide 2-3 hunts for us each year. This guy knows his stuff. 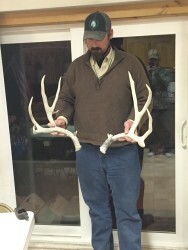 His passion for hunting and shed spotting will amaze just about anyone. Chance Barrett, 34 year old Montana native grew up farming and ranching in Winfred, MT and moved around working on ranches until his wife convinced him to move back to Miles City in 2016. He has been hunting since he was knee high to a grasshopper. Chance is a jack of all trades; he builds saddles, tack, gun accessories, trucks and does day work for ranchers around Miles City. His wife and two wild toddlers keep him busy too. Don’t let Chance’s size scare his sense of humor and quick whit make him as friendly as teddy bear. 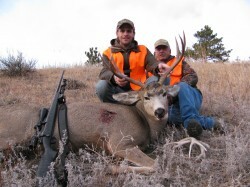 muledeer@midrivers.com 406-232-4910. Also you can contact us through our website under the “Contact Us” tab.